This expansion to the parking deck used by the Health System’s staff brought the total number of parking spaces to 1,388. The existing parking deck remained open throughout construction. The project included the relocation of all utilities, including domestic water, cable television, telephone, data communication, and power, all of which had to be maintained throughout the relocation process. As part of the construction, a temporary road replaced a previously existing dead-end street in order to provide access to adjacent buildings. The exterior design of this garage was very important due to the architectural heritage of UVA’s historical buildings, many of which were designed by Thomas Jefferson. Aesthetically-pleasing buff-colored precast concrete columns and spandrels with thin-set red brick tile make up the façade of the parking deck, while three red brick and glass stair towers and one elevator tower help to visually break up the horizontal length of the structure. 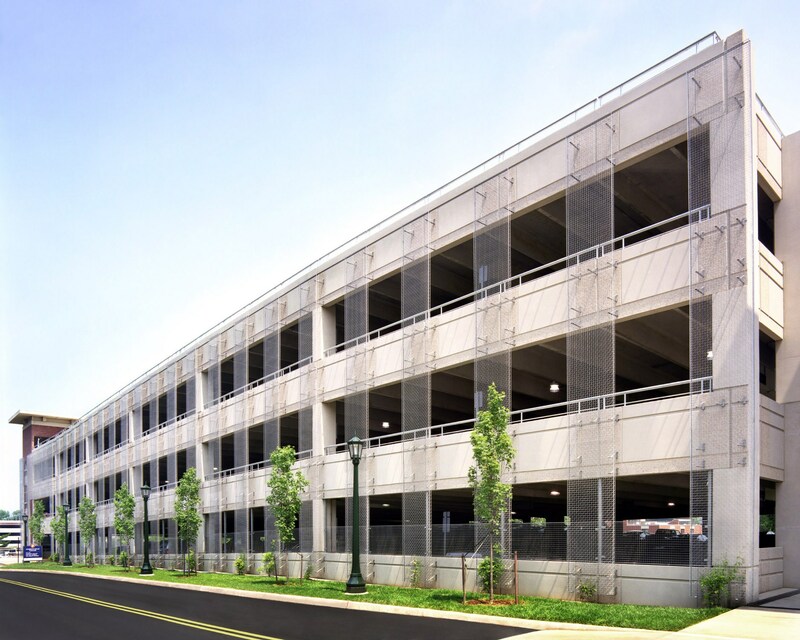 Inside, the garage’s long-span structural system creates clear sight lines, facilitating better surveillance throughout the facility for customers and security personnel. The structure is situated on a 4.5-acre site that includes a stream, wooded areas, and extensive landscaping, providing a parklike appearance. The stream, which had to be rerouted as part of the construction process, is part of a regional stormwater management system that also includes a retention basin. 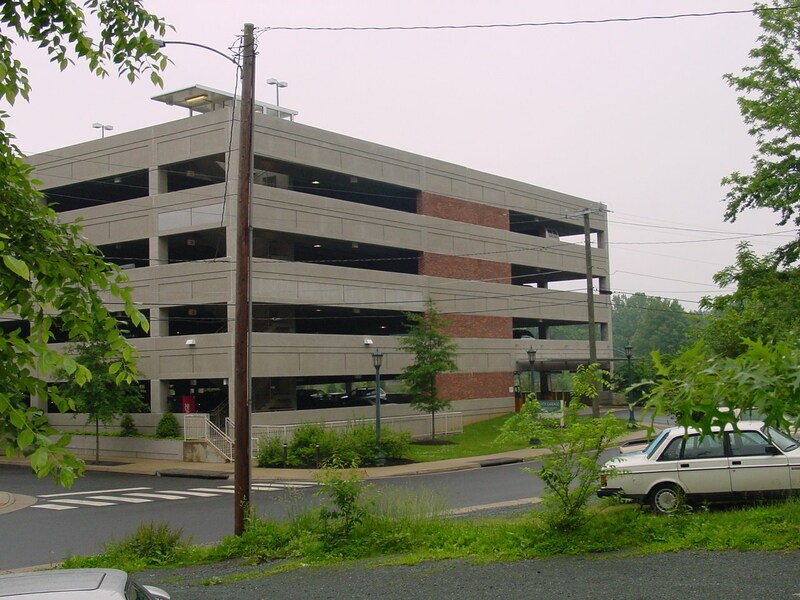 This parking deck, located in the university’s Arts Grounds section of campus, is used for the daily parking of students and faculty, as well as by visitors to the nearby Drama Building. The structure is built into the side of a hill, resulting in one elevation being below grade for the first two floors. The deck’s exterior walls have green screen to soften the architecture and create a visually pleasing facade. The facility features two stair towers and one elevator, with provisions to add a second elevator in the future. This 4-story academic building, originally constructed in 1973, consists of general classrooms, as well as offices and research/meeting space for faculty, staff, and graduate students of the Curry School of Education. The renovation restructured the existing space for faculty offices and academic programs and create additional classrooms, administrative offices, and student study group space. On the third floor of the renovated facility, the Curry Library and Innovation Commons (CLIC) are used as a study area and for small classes, meetings, and presentations. The space also serves as a computer lab and a library for the faculty. The main lobby houses a cafe where students and faculty can grab a quick bite to eat or a cup of coffee between classes. 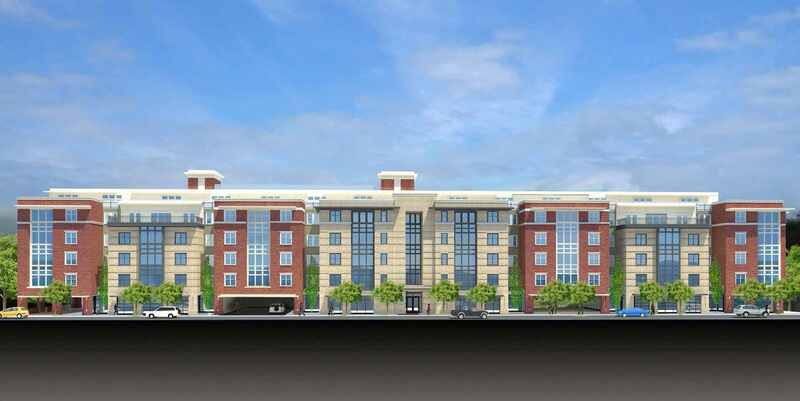 The project includes complete replacement of MEP systems, hazardous material abatement, roof replacement, elevator replacement, ADAAG compliance, replacement windows with low-emissivity glass, removal and reinstallation of soffits, and repair of exterior masonry, as well as replacement of interior finishes. A new entrance opens to the courtyard at Bavaro Hall, a facility for which Donley’s also served as Construction Manager. This project includes a 30,000 sq. ft. addition consisting of an aquatics facility with a 25-meter 8-lane pool, whirlpool, sauna, and locker rooms; a mind-body multi-purpose fitness room; two squash courts; a wet classroom; and a new circulation lobby with an elevator. Also included in the project are 7,000 sq. ft. of renovations, including improvements to two of the facility’s existing racquetball courts, lobby, and social gathering space, as well as removal of two squash courts for increased fitness area. New circulation and social spaces will enhance the connection between the existing building and the new addition. 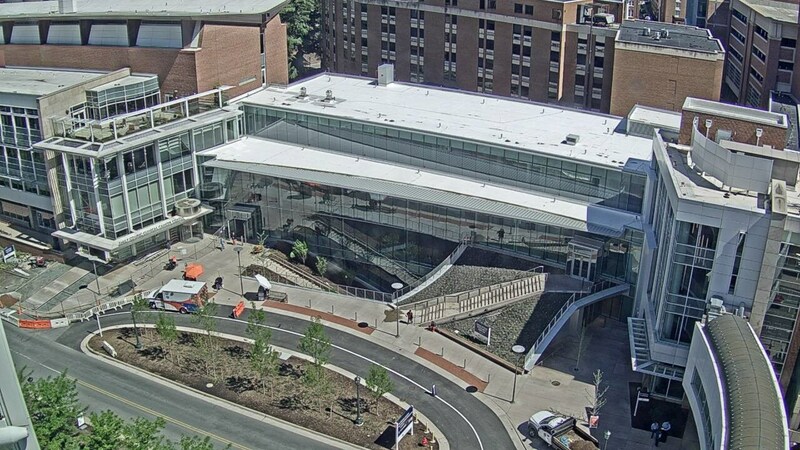 One of several projects included in the University’s plans to revamp its Arts Grounds, Ruffin Hall is the first new building to be constructed in this area of campus since the 1974. Home to the McIntire Department of Art’s studio art program, the new three-story facility helps the program meet the growing demand for its courses and unites all of the studio program’s classrooms and faculty offices under one roof. Envisioned as a “village of the arts,” Ruffin Hall features abundant natural light, wide hallways for exhibiting student and faculty work, the latest ventilation systems, and freight elevators for moving large objects. The facility houses low-maintenance studios designed specifically for the teaching of painting, drawing, sculpture, printmaking, photography, performance art, and digital media. Updated classrooms, exhibition galleries, workrooms, faculty offices, and outdoor work spaces are just some of the much-appreciated features in the new facility. This project provided much needed space for the School of Architecture’s programs, while also serving as a tool to educate students in responsible building and the incorporation of technology with design. The South Addition was designed by William Sherman, Associate Professor and former Chair of the Department of Architecture and Landscape Architecture. The 7,620 sq. ft. addition provides 26 new faculty offices, as well as conference rooms, review rooms, and a faculty research studio. This portion of the project also included the renovation of a portion of the existing south wing. As part of the renovation, the existing south stairwell was enclosed and a large landing between floors was fitted with an inverted sundial, a sliver of light, measuring the hours and the seasons. The East Addition was designed by W. G. Clark, Professor of Architecture, and consists of a tall, thin 6,810 sq. ft. mini-tower that serves as the new face of the school. The design incorporated a new lower level entry and reception hall that features review and exhibit areas. This new four-story building nearly doubles the space previously available to the School of Education, providing badly needed offices, clinics, and common spaces for its diverse array of academic, research, and clinical programs. Located on a steeply sloped site at the western perimeter of the university’s historic Central Grounds, Bavaro Hall features red brick and limestone façades with painted wood trim, six-over-six double-hung windows, and a metal standing-seam roof. 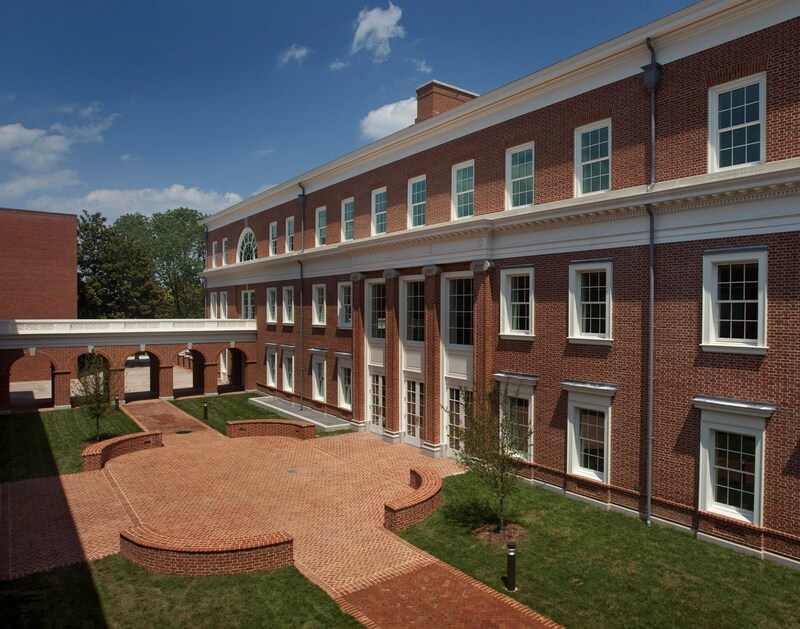 Bavaro Hall and the School’s former home, Ruffner Hall, are linked by an inviting courtyard garden framed between two open-air colonnades. The first floor of the new facility accommodates student services, the dean’s suite, conference and meeting spaces, a large multipurpose room, a coffee bar, and the Commons, the School’s primary indoor social gathering space, which opens directly to the courtyard for indoor/outdoor events. Two generously proportioned naturally-lit stairs lead up to departmental suites, faculty offices, and meeting rooms on the upper two floors. Bavaro Hall houses 55 individual faculty offices, 10 conference rooms, five program area suites, four administrative suites, and a great room lecture hall.